The hillside west of the accident site has west-facing slopes ranging from 20-40 percent. The uniform fuel complex is was dominated by a well-developed herbaceous brush mix with 90 percent crown closure, under a live oak canopy that averaged approximately 20 feet tall and ranged from 30-90 % cover. The live fuel components were well below critical levels (what was %). The dead component is estimated as light to moderate, approximately 30 percent. Fire history for the area was not complete and it is estimated the last fire through the area was 50 to 60 years ago. During the 36 months previous to the accident the area has only received between 50-70 percent of normal precipitation. The Palmer Drought Index shows a preliminary drought (index of – 2.88) with 2.07 inches of precipitation necessary to emerge out of the drought condition. The relative orientation of the San Diego river drainage below the accident site is NNE to SSW. The elevation where the drainage crosses Highway 78/79 is approximately 3,440 feet. The elevation at the head of the canyon is 4,136 feet and the elevation at the accident site is 3,822 feet. The ridge along the west side of the San Diego River drainage ranges from 3,723 feet to 3,678 feet. Directly west of the accident site there is a saddle that drops to approximately 3,600 feet. The accident site is on a high point along the ridge with a chimney/saddle immediately to the south (between 920 and 930) and immediately to the north (between 920 and the 914 site). The garage and 90-degree turn in the driveway are in the northern saddle. The accident site house at 920 Orchard Lane was a one-story 2,045 square foot single-family dwelling built in 1977. It was located on a four-acre parcel on the top of the ridge, 300 feet west of, and 69 feet above, Orchard Lane. The layout of the house was basically a rectangle 23 feet wide and 78 feet long, with the long dimension oriented approximately parallel to the ridgeline. The northern end of the long dimension was oriented towards the north-northeast (referred to as north for reference and discussion). The north end of the house included a 31-foot diameter hexagonal area with a stone chimney in the center, which is the prominent feature visible in post-fire photographs. The concrete driveway from Orchard Lane ends at the north end of the house. The unimproved dirt surface driving or parking area, which varies in width from 15 feet to 35 feet, extends for a total of 150 feet south from the end of the driveway along the entire west side of the house and extending 75** feet south of the house along the patio and flower garden (** measurements “from the house” refer to distances measured from the exterior wall of the house). The exterior house construction consisted of stucco walls and a combination of roof coverings consisting of composition shingle and flat rolled roof covering. 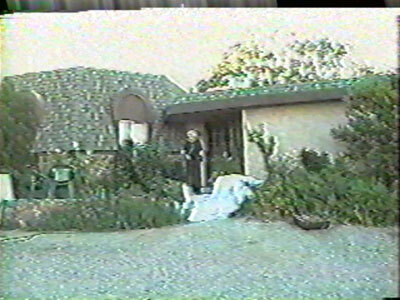 * NOTE: All photos from the “Lis family video” are still images captured from the original VHS video. The approximate date of filming was June 2001. Any changes in conditions, such as reduction in the amount of vegetation, during the three years between the video filming and the fire are not reflected in the photos. A wooden deck, approximately one to three feet above the ground, extended for 19 feet to the north and northeast off two sides of the octagonal portion of the house. On the east side of the house, a wooden deck walkway extended south of the main deck area between the house and large boulders to the rear door. 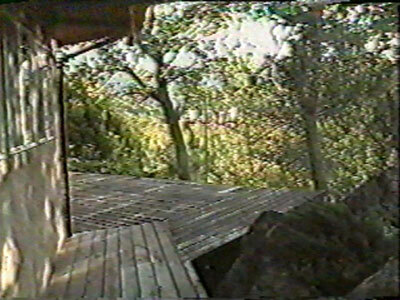 Photo from the 2001 Lis family video showing the east side of the house looking northeast at the eastern portion of the main wooden deck from the wooden walkway. The northern end of the large boulders is shown on the right side. From the rear door, the walkway continued south 48 feet as a concrete path, connecting the rear door to a 14 by 28 foot concrete patio on the south end of the house. The patio was surrounded on the south and west sides by a planter strip with a continuous juniper hedge (see description below) and a rock wall two to three feet above grade level. A flower garden approximately 30 by 40 feet in size extends south of the patio and rock wall. Concrete and stone steps on the west side of the patio lead down to the dirt parking area where Engine 6162 was parked, two to three feet below the level of the patio. A detached garage was located 80 feet north-northwest of the house on the west side of the driveway. It was a 25-foot by 25-foot wood-frame stucco structure with doors facing north. 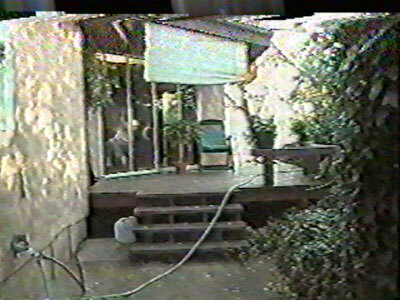 Photo from the 2001 Lis family video showing the east side of the house looking northeast at the wooden walkway to the deck and the northern end of the concrete walkway. The back door is to the left at the top of the stairs. The kitchen is through the sliding glass doors. The vegetation fueling the wildfire, which burned in the immediate vicinity of 920 Orchard Lane, may be characterized in two groups – managed landscape plantings (described below) and relatively unmanaged brush and oak wildland fuels. The heavy brush and oak wildland fuel bed is fully described in the Fire Reconstruction…Executive Summary (Tab Section 251) and the Fire Reconstruction...full report (Tab Section 252). Extensive clearance of this wildland brush existed in all directions around the house. Downhill, in the direction of the fire approach to the west, the wildland brush began approximately160 feet below the northwest corner of the house. There was 180 feet of brush clearance downhill from the southwest corner of the house where Engine 6162 was located. There was no evidence of recent brush clearance activity, such as cut brush stumps, in the large cleared area below the house. Fuels in this area, which measured approximately 170 feet deep and 200 feet along the driveway, consisted of light grass stubble closer to the brush and oak leaf litter or cleared ground closer to the house. 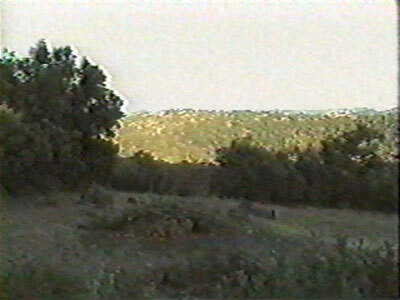 Photo from the 2001 Lis family video looking southwest from the dirt driveway at the southern end of the large brush clearance area below the house. The image is recorded from the general area of where Engine 6162 was parked. To the south of the house the brush clearance extended approximately 100 feet, or approximately 40 feet behind Engine 6162. There was approximately 70 feet of brush clearance east of the house, which was the leeward side of the house during the entrapment. Due east from the northern end of the house, beginning approximately 30 feet east of the house deck, a large unburned island of oaks extends along the south side of the driveway down to Orchard lane, an area approximately 280 feet long by 50 feet wide (see Figure 4). There was no consumption of the oak tree canopy in this area and only partial burning of the surface fuels. In this area closest to the house, the unburned surface fuels consisted of oak leaf litter. The grass, if any, had been cleared and there were no ladder fuels below the tree canopies. To the north of the house the brush fuel bed began along the north side of the driveway, 115 feet north of the house. Photo from the 2001 Lis family video looking southeast from the dirt driveway. Brush clearance to the south of the house just visible to the right of the large boulder. The box hedge and rock wall next to where Engine 6162 was parked is in the center of the image. There was extensive management of the vegetation and grounds for approximately 70 to 180 feet around 920 Orchard Lane. The most prominent feature of this landscaped area was the large cleared area west of the house in the direction of fire approach. This area can be easily seen in Figure 9, the pre-burn accident site aerial photograph taken in July 2000. Forty-five feet west of the house front door was an herbaceous hedge bordering the driveway with a rock path leading down several steps to a relatively flat garden area approximately 30 deep and 50 feet long parallel to the driveway. This garden was at the northeastern end of large cleared area and contained well-separated herbaceous plantings, small woody shrubs and a few small fruit trees. On the west side of the house on either side of the front door were several two to four foot tall shrubs. South of the front door were two large shrubs reaching to the roofline (visible in Lis family video photo of the front door above), and a 20 to 30 foot tall oak tree towards the southwest corner of the house. 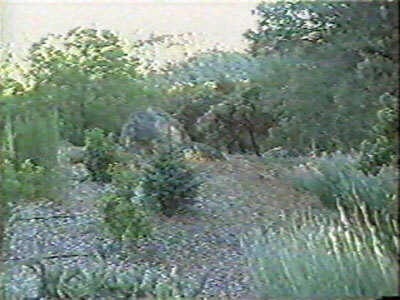 Photo from the 2001 Lis family video looking northwest at the garden west of the front door. The image is recorded from the rock path / steps (shown in Figure 2) leading through the herbaceous hedge. The patio on the south end of the house was surrounded on the west, south, and east sides by a juniper hedge. 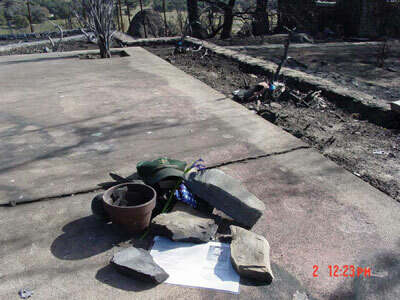 The linear burn pattern along the south edge of the patio concrete appears to indicate that the juniper hedge was continuous, and encroached approximately one foot over the southern patio surface. It also extended around both southwest and southeast corners of the patio and on both sides of the steps to the driveway. The perimeter of the hedge, as estimated from patio burn patterns, is shown on Figure 2 and Figure 4. The extent of recent pruning of the Juniper hedge is unknown and the height of the hedge is not estimated. A tall cylindrical shaped Juniper-like coniferous shrub was planted in each of the “tree well” planting boxes shown at the two corners of the patio in Figure 4. The canopy of a 16-inch diameter oak tree covers the entire patio as shown in aerial photograph Figure 8. Photo of the accident site patio at the south end of the 920 Orchard Lane house. Juniper hedge stumps can be seen between the southern edge of the patio and the rock wall on the right, and in the triangular planting area adjoining the eastern end of the patio. One of the two shrub stumps located in the “tree wells” (shown in Figure 4) can be seen at the top of the photo. The concrete patio burn pattern, indicating the presence of a continuous Juniper hedge encroaching over the patio, is shown along the right edge of the patio* . The concrete patio burn spall marks indicated in Figures 4 & 5 can been seen around the memorial items in the center of the picture (photo reference - Foote item #51 Tab Section 122). * For additional Juniper hedge burn pattern images see: Tab Section 108 photo item number 25; Tab Section 110 photo item numbers 24, 53 & 59; and Tab Section 115 photo item number 66. Along the east side at the rear of the house most of the landscaping had been recently removed leaving two grape vines and some wisteria all of which had lost it’s foliage by the time of the fire. A large rock outcropping adjacent to the house, approximately 20 feet in diameter and six to10 feet in height, extended from the area of the back door to the southeast end of the wooden deck. A row of approximately five-inch diameter shrubs lines what would have been the northern edge of the wooden deck (see white steno pad in photo #12:20). With the wooden deck extending past the cinder blocks, this hedge would have created a continuous fuel bed from the landscape vegetation to the readily ignitable structural materials of the house deck. The landscaped area in the 110 feet north of the house to the driveway was denser than elsewhere on the property. Another row of burned out shrubs lines the southern edge of the driveway directly north of the house. 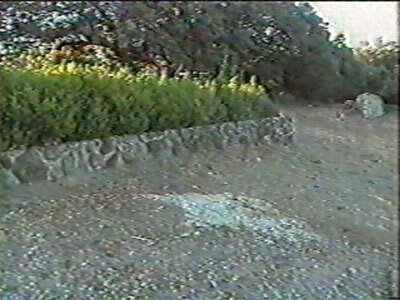 The June 2001 video photograph of the driveway shows continuous surface fuels to the right of the driveway looking north, although some of this could have been pruned in the intervening years. There is 90+% closure of the conifer and oak tree canopy over this area. There are also rock retaining walls, paved walking paths, and patio areas throughout the area with patches of unburned surface fuels. 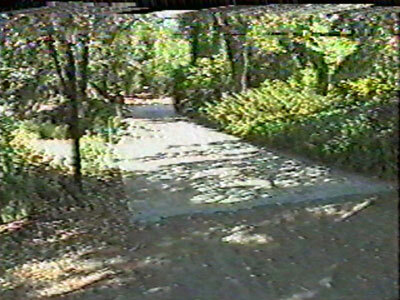 Photo from the 2001 Lis family video looking north at the driveway. Continuous, heavy, landscaped surface fuels can be seen on the right side of the driveway above and in the post fire photo (Tab Section 108 photo item #41) of the same area. Orchard Road leads directly from Highway 78/79 and proceeds in a generally straight path toward the north. Orchard Road is the access route that leads directly to the driveway of the accident site (920 Orchard) and terminates at the driveway of 902 Orchard Road at its northernmost point. The road has a small turnout opposite and just south of the driveway of the accident location. From the intersection of Highway 78 to the driveway of the accident location, it measures 0.8 miles. The distance to its endpoint at 902 Orchard is 0.9 miles. The road varies in width from approximately nine feet to 14 feet. It is unimproved other than gravel over compacted dirt. The driveway to 920 Orchard forms an approximate 43 degree angle with the main road and proceeds initially in a northwest direction. The 490 foot concrete driveway continues upslope where it terminates near the northwest corner of the residence along the ridgeline. The overall slope from beginning to end of the concrete section is 16 percent with the steepest point being approximately 20 percent. The driveway is nine feet wide and is lined with brush and trees on both sides. As it continues upslope, at the 60 foot mark the driveway makes a turnout to the north and proceeds back in a westerly direction to the 110 foot mark. This turnout coincides with the steepest slope of the run. This deviation combined with a culvert that exits to the north edge of the concrete drive in this turnout makes traversing this portion with an engine a slow and calculated process. At the top of the ridgeline, the driveway forms a sharp right angle where it finally terminates near the northwest corner of the house. At the final portion of the curve, a short section exits and proceeds to the detached garage. At the end of the concrete section, the driveway continues along the ridgeline and proceeds along the west face of the house. This section of the driveway is an unimproved dirt surface and proceeds 150 feet in a south-southwest direction before it terminates just past the concrete patio. Two driveways lead to 902 Orchard Road (to the north on Orchard Road from 920 Orchard) and ultimately join along the ridgeline. The overall effect of the driveway is to circumferentially wrap the property. It is a primarily dirt surface. There is little vegetation to either of its immediate edges. The driveway to 930 Orchard Road (the next residence south of 920 Orchard Road) proceeds upslope to the residence and ridgeline. It is entirely surfaced in blacktop and is lined on both sides by dense brush. The brush is sufficiently thick that it encroaches upon the driveway.